This DXpedition was unique in one sense; it has received unprecedented media attention. First, during the DXpedition, a report with an interview of Jim Solatie was aired on Kotimaan katsaus, a current affairs program on YLE TV2, the second channel of the Finnish Broadcasting Company (YLE). 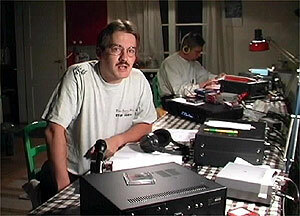 Also I, Mika Mäkeläinen reported on DXing - focusing on our DXpedition - for CNN International. My report for CNN was aired on World Report on December 7th and 12th 1999. Thanks to all who have sent comments on the story! With a potential audience of 400 million TV households around the world, a few more people may now have some idea of what DXing is. The publicity was of course focused on the strange and exotic phenomenon of DXers camping in the Arctic in general - the results of this particular DXpedition were not spectacular enough to warrant any special attention on the hobby, although we are very happy with our catches. Our journey to Lemmenjoki began on the evening of Sunday, November 14th, at the Helsinki railway station. Jim's 4-wheel drive Honda was packed on the train and we slept through the night, arriving in Rovaniemi on the Arctic circle after 12 hours. 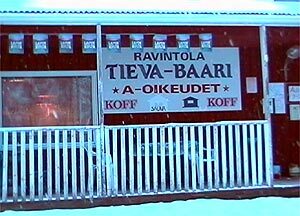 Our first stopover was Kittilä some 180 kilometers northwest, to buy groceries for the week. An old lady in the cashier line ahead of me was astonished: "My God, am I glad I'm not standing behind you! You must have enough to eat for a month, or two months!". Well, we did consume almost everything... And since our culinary expertise is limited to switching the microwave oven on, we decided to enjoy a large pizza before leaving the last outpost of civilization. Well, almost the last anyway. On the way to Lemmenjoki there is the legendary Tieva-baari in the tiny village of Pokka. A cafe would be an overstatement, more to the point it's the only place within a radius of about 100 kilometers where alcohol is served. During our last visit there in 1998 the locals looked at us suspiciously, kept silent from the minute we stepped in, and, one by one, left the place... This time we only encountered a dozen military personnel with their snow mobiles parked outside! After a couple of hours drive from Kittilä we arrived in Lemmenjoki after 3 p.m. The scene already looked quite wintry with the nearby lake frozen and about 10 centimeters of snow on the ground. It snowed more in the coming days with temperatures between -5 and -15 degrees Celsius. 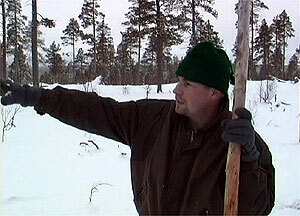 By the end of our DXpedition, the weather became warmer again and some of the snow melted away. With mostly sub-zero temperatures, we kept the cabin warm by using the fireplace almost non-stop. LEM132 was the 4th DXpedition of the season to Lemmenjoki. This fall some new equipment had been added; an antenna pointing at 70 degrees, which we expected to yield good catches from South-East Asia. Also, a new kind of antenna splitter was in place, and allowed a record number of antennae for both users. More on our equipment here. Because of a major magnetic storm forecast, we adjusted our timing by arriving five days earlier than originally planned. A day before heading north, the Northern lights (aurora borealis) were visible as far south as Helsinki. This is very rare, and the surprising lightshow was clearly an indication of poor conditions on the dial, so revising our schedule made our prospects only worse. Anyhow, this time there seemed to be hardly any correlation between solar indices and good conditions. Taking a closer look at different targets, North America was traditionally one of our main areas of interest. When we got our gear in order just before 1400 UTC (4 p.m. local time) on Monday, NA West Coast signals were pretty good. That lasted for ten minutes, after which very few North American stations were heard for the following five days. There was only a short peak in the signals around 0700 UTC, at sunrise local time. The situation improved somewhat on Sunday, Nov. 21st, when signals were heard also in the afternoon. The conditions improved even more on Monday morning, when we were supposed to leave. To catch some more U.S. stations, we took a one-day extension with the kind approval of our wives. When conditions allowed, we usually hunted the X-band stations and left the other set to record some graveyard frequency. A bunch of Alaskan and Hawaiian stations were audible on several days, but nothing new for us. Central American and Caribbean signals were practically non-existent. We got some nice openings to South America just before sunrise (around 0600 UTC), especially to the southern part of Brazil, but otherwise South Americans were few. No sign of the Falklands on 530 kHz. Shortwave signals were extremely poor, both at night and in the morning. We had high hopes concerning Asia, and it was indeed the most productive continent in terms of new catches. The new beverage antenna was very good for southern China, Vietnam and Thailand. There still isn't a decent antenna for India, but this new antenna slightly improved reception even from that area. Conditions to Japan were good on Tuesday, Nov. 16th, when even frequencies such as 1359 and 1467 kHz yielded interesting NHK stations. Overall, the best catch from Asia was probably Jim's Indonesian station on 1485 kHz. Even though RRI Jakarta was audible on 999 kHz on several days, only one Australian AM station was heard. An intense search for new Pacific countries was fruitless. From Africa the most interesting catch was definitely Emissora Provincial de Benguela on 1502 kHz, which we both have hunted for years. The Iberian peninsula was not too bad, but we could have had better luck; excellent conditions were observed in the morning of Sunday, Nov. 21st, but since there were no local breaks on Sunday morning, the peak was useless. In the evenings and mornings we spent quite a lot of time listening to the rest of Europe, partly because on some occasions not much else was audible. The biggest surprise near the home front was Radiophonikos Stathmos Amaliadas from Greece on 1584 kHz, which we thought would have been extinct for years. For the first five days, not much was heard in the daytime around 0700-1300 UTC, so we had ample time to check the antennae. Still, overall, I consider the catch pretty good under the circumstances of high solar activity. We both got over 100 stations that were new to us. Finally, for details on the identified stations, here's the LEM132 DXpedition log you have been waiting for. For some logging guidelines, check out notes on the log.